I'm guessing these three thugs are part of Kurt Kordok's gang. Therefore, we can add hippies to the list of groups Kordok is willing to hire or induct or whatever it is gang leaders do. The driver of the car looks oddly familiar, but I can't for the life of me figure out why he looks familiar. I suppose he sort of looks like Frankenstein's Monster, though. I wish the Hippie with a Gun said "Here comes the Spider-Man", though. I'm a sucker for references like that. That's exactly what I said on Sunday, Spider-Man. He's also reading it in plain sight of a bunch of consumers. You have to wonder, would having Spider-Man read your paper be a good bit or bad bit of publicity? Especially for the Bugle. It could go either way, I suppose. Yesterday's comments are equally valid here. Though I would like to remark that Maria Lopez's claim in panel three reminds me of the "Amazing Mister Brisby" episode of the cartoon "Venture Brothers", in which a paramilitary group from California was dedicated to eradicating the Disneyland-like park in the episode because of all the land and money it sucked up. A small bit of research shows that this paramilitary group was just an exaggerated version of some California residents' complaints about the park. Therefore, it stands to reason that if Spider-Man is the best thing to happen to California since Disneyland, that's still not entirely good. Me? I am all about Disney, especially its ducks. So I would think Spider-Man and Disneyland are the bee's knees, if I was a character in this strip. EDIT: I figured out today that this was the hundredth post! Hooray! I was hoping to see more of Kurt Kordok today, but I guess I'll settle for the ongoing exploits of Jonah Jameson, Boy Pundit and his arch-nemesis, Maria Lopez... er... I can't think of anything witty to call her. Which is probably what Stan Lee thought when he was writing this strip and had to name Jonah's show. "LA My Way"? Hopefully its theme song is the song "My Way", as sung by Jonah Jameson. He's the self-proclaimed King of All Media, so why not? I have to say, despite everything, I have a certain amount of admiration for Jonah. No matter how many tell him he's wrong and no matter how man times he's been proven wrong, he stands by his belief that Spider-Man is a threat and/or menace. That takes moxie, my friends. One week ago, more or less, I asked you to vote for your preferred Marvella color scheme, and six of you voted. That's about six more people than I expected, so I'm rather pleased with that. However, six is an even number. This would not be a problem, except three people voted for each color scheme, which means that either this poll extends for another week or I cast the tie-breaking vote. I shall opt to do the second, at the end of this post. 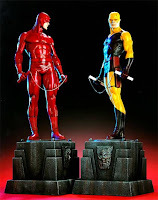 The most striking thing to me about the two Marvella costumes is how much they remind me of Daredevil's two most well-known costumes, seen to the left. This is probably just a fluke, but an interesting fluke nonetheless. Design-wise, the Marvella costume is typical super-hero fare: flowing cape, buccaneer boots and gloves, and a symbol across the chest. I really thought I run with this a bit longer, but my mind is drawing a blank as to how long I can talk about a woman's costume and make it seem interesting. In that case, let us go onward to my voting. WHile both costumes have their pros and cons, I must say the Sunday one simply strikes me as an atrocious color-scheme. The weekday one, however, pleases my feeble sense of fashionable costumes a great deal more. What I'm getting at is that I vote for the weekday costume, and therefore it's the winner. Congratulations, weekday costume. Speaking of costumes, I just read "Civil War Front Line" #10 and Speedball's new costume concept is like the creepiest thing I've read in a Marvel or DC Comic. It gives me shivers just thinking about it. The bad kind of shivers. Ah, and if you enjoyed this poll and would like me to do more of them in the future, just let me know through email, an instant messenger, or even in the comments section. The same goes for the opposite: if you hated the poll, let me know! Well, this is promising. Either Kurt Kordok was in the strip previously, just a long time ago, or he's another villain in disguise. Yes, I'm still holding out that this fellow is the disguised Kingpin. At this point either one is a pretty even bet. The last time Kingpin was seen in this strip, he had lured Spider-Man into a sealed room, save for an air-grate. Spider-Man defeated him by webbing up the air-grate, and eventually Kingpin passed out. That was years ago, though, and I don't remember if Kingpin was jailed or not. Only time will tell if Kordok is a new threat, or an old one in new clothes and a toupee. I am rambling. This is the final day to vote in this week's poll. Well, it's not Kingpin and it's not Hammerhead. It's some new guy named Kurt Kordok, as you can see. What do we know about this newcomer? 2) There is no themed-dress in his syndicate. Unlike some crime bosses who would enact an all-1920's Gangster dress code (Hammerhead) or a Modern-era Mobster dress code (Kingpin), Kordok does not seem to care. We've seen a pirate, a common thug, and now this Jimmy Olsen-like fellow above. 3) He's either quite bulky or quite fat. Perhaps both, which would mean he's weaseling in on the Kingpin's territory. 4) The man does not have the speech patterns of a cultured mafioso. All in all, I'd say Kordok does not think things through (abusing henchmen is a sure way to receive a comeuppance later) and has no need for the theatrical (like themed dress codes). While the common thugs he hires are no doubt afraid of crossing him, Spider-Man should have little to no problem taking him down. 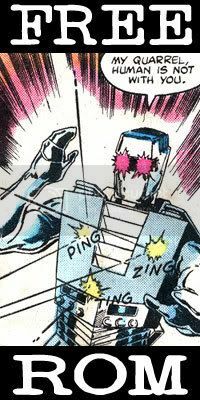 Unless Kordok turns out to be the Kingpin in disguise, which might be the case, considering the pair's similar builds. Voting in the poll ends tomorrow, so get those votes in! Currently, it's amazingly tied. If the crime boss is punching a wall in anger at the web-slinger, then chances are the pair have some sort of history. It could just be some guy Spider-Man caught once, but hopefully it's the Kingpin. If it is the Kingpin, I hope the coloring people color him correctly. The man has a look, after all. Also, I'm a little concerned that Spider-Man feels the need to make conversation with petty thugs. Now, the daily reminder of the poll. There it was. Two more days until the votes are tallied. The cops seem to just accept Spider-Man, who showed up like a week ago comic time, and his vigilantism. That's something Los Angeles offers that New York does not. However, how would they know that he's been playing "rougher than usual". As mentioned, Spider-Man has been in town for a week, maybe two. In any case, less than a month. There's no way all the crimes he's busted could be concentrated in the area this cop is assigned to, in order for the cop to make such a comment. Unless, of course, the cop has learned of Spider-Man's exploits from other policemen or possibly web sites and chat groups. This is the age of information, after all. Speaking of information, the poll is still going on. Click here to participate. I hope this leads to a super-villain. Chances are it'll just lead to an aspiring mafioso, though. Maybe it'll be Kingpin or something, looking to start up on the West Coast. I hope this is the case. Also, I am disappointed that the "Goofus and Gallant" style thing did not happen. Just a reminder that we have a poll going on. Click here to find out more and participate, hopefully. It appears Mary Jane's movie involves her battling a mowhawked cowboy and John Constantine. However, it seems to be fairly true to life as Spider-Man is battling a random thug and a pirate. He does not seem to take them seriously, though, as he's literally slapping them around. I sort of hope the entire week is like this, a sort of "Goofus and Gallant" showcasing Mary Jane and Spider-Man doing the exact same bloody thing, only one is FOR REAL. There's so many possibilities for it that I'll be disappointed if it doesn't happen. Also a reminder about the poll: Marvella's Weekday costume versus her Sunday costume. Which do YOU prefer? Just add your two cents to Sunday's post, and we'll tally up the votes for next Sunday. Mary Jane seems to be feeling better, which is nice. Peter seems to be all right, too, while he's fighting what appears to be a squad of Silver Age Lex Luthors. It also seems that Mary Jane's co-star has gotten over her jealousy of her, or at least has the professionalism to keep it off the set. All in all, a happy day for everyone except the Luthors! Now, if you will, I would like to conduct a poll! My questions is this: which color scheme do you prefer? Just leave your vote in the comments, and I guess they'll be tallied for next Sunday. We have a forum if you'd like to use the forum. No one ever does though, so it's no big deal. Also, we might have Project Wonderful ads soon. Mary Jane, Peter did not come with you because he wanted to web-sling so badly and could not think of a way to do so in the desert. Peter, on the other hand, is web-slinging because he misses Mary Jane so much. There's an easy solution to this problem, but unfortunately it's too late for that now. Unless, of course, Peter found some way to get to the airport faster than the limo. LIKE WEB-SLINGING. I get that Peter is sad that his wife is off to film in the desert for a week, but does he have to act so pouty about it? She offered to take you with her, Peter. Stop acting like a spoiled brat. What are you going to do now, stomp back inside and slam the door behind you? I just hope there's a crisis so we can be spared of all this whiny Peter nonsense. Peter, she offered to take you along with her. Sure, you'd be stuck in a trailer all day but at least you'd be with her. Which is what you should be thinking right now. I'm glad they aren't going to spend the rest of the week fighting. Of course, now Mary Jane is going to rush off to catch up on filming her "Marvella" movie, which must be like the most anticipated thing ever now. I mean, first a crazy butler almost kills Mary Jane Watson, now Doctor Octopus. People will be lining up to see this thing. Will it be any good, though? I'm guessing some future storyline will be Mary Jane having a hissy-fit about how a critic gave her movie a bad review or something. Just to recap: Mary Jane is mad at Peter for leaving while she was being interviewed, which Peter did because he felt neglected. Peter, on the other hand, felt neglected while she was being interviewed, which is why he left. So this week is going to feature a domestic squabble. On the plus side, however, I really like the first panel in today's comic. The Proportionate Poutiness of a Spider? Ah, there's going to be nothing going on with Spider-Man's marriage. He's just going to pout this week about how he feels he's losing Mary Jane, no doubt to have her come in at the end of this week and make him feel loved again. That's a load off my mind. It's nice to see Spider-Man do something heroic/good and not immediately get his mood shot down by a civilian, police officer, or someone from the media. However, it's not nice to see a next box proclaiming that there will be "Heartbreak for a Hero". However, since Spider-Man seems to be staying in Hollywood or wherever and the newspaper strip is seperate from the comic books, maybe we can get Simon Williams (Wonder Man) in as a supporting character. He is an actor, after all. The man is only happy when he's in a colorful costume and web-slinging around town, righting wrongs and punching people. He craves the adventure and fame being a super-hero offers him, and deplores the mundane aspects of day-to-day life. He's always been this way, but at first, he at least pondered upon the troubles that faced him in both identities. It's one of the things that made him so popular. This incarnation seems to just dig being a superhero and despise being a civilian. Peter really should be going deeper into that alley, as someone's going to catch him changing. Also, it's only been about ten minutes, maybe half an hour, since he arrived on the scene as Peter Parker. The man is probably addicted to being Spider-Man, and was just using all his pouty ponderings to justify sneaking away to change into his costume. Still, this means that something interesting might be going on somewhat soon. At least in theory. In order to be the King of All Media, one has to have a certain amount of charisma. What Jameson has is a sort of anti-charisma, like a car crash or something. Hopefully this doesn't set up a Jameson radio talk show, as that would just be way too much. Meanwhile, Mary Jane proves to not have one of the characteristics of today's starlets (the need to whore as much attention as possible no matter who gets in the way) and Peter Parker proves he has the proportionate pouting power of a spider. Well... Jameson is either really rich or really crazy. I think it's the former, but I hope it's the latter. Peter should be at least somewhat happy. Now he has someone in the media that's in favor of his web-slinging activities. The Mary Jane thing is just an ironic role reversal, leaving Peter by himself most of the time while she goes off to play a super-hero. All in all, though, things are looking up for him. -The Parkers and Jonah Jameson stay in Los Angeles, and perhaps Robbie Robertson comes over. -Maria Lopez becomes a reoccuring character, trying to scoop Jonah at every turn. -Every single villian that shows up has something to do with Mary Jane's movie shoot. If any villian shows up at all.